Donated by: David Booth, HP Australia. 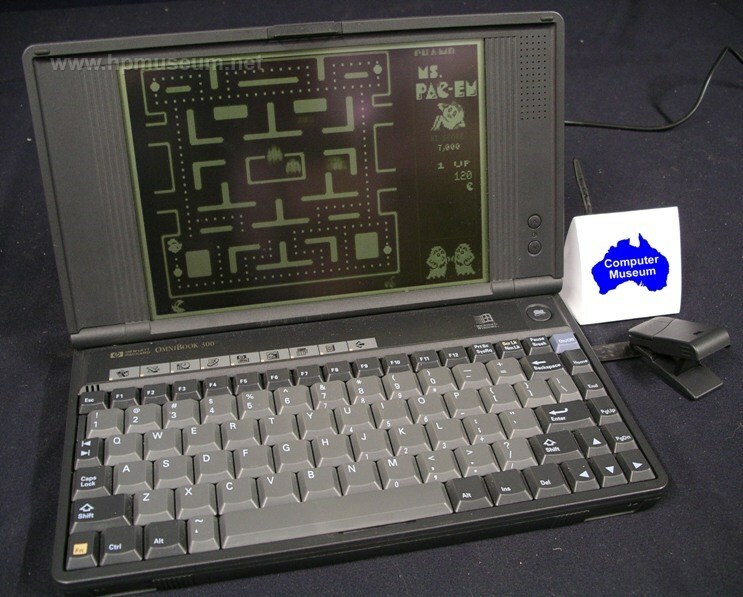 The original Omnibook 300 came with an Intel 386SXLV CPU and a nine-inch monochrome VGA display with 16 shades of gray. The rechargeable battery offered five hours of use in the hard disc model and nine hours of use in the flash memory model. It could be recharged in 1.5 hours. In a pinch, the Omnibook 300 could also run on 4 AA batteries. It came standard with 2 MB RAM, a 9-pin serial port and a parallel printer port. The Omnibook 300 had two PCMCIA slots in which to connect additional memory, modem, network card or other peripheral. The Omnibook came in three mass storage configurations: no mass storage (F1030A at $1515), 10MB flash disc (F1031A at $2375), or 40 MB hard disc (F1032A at $1950). Click here to view Retro Tech's video on the 20th anniversary of the Omnibook 300.